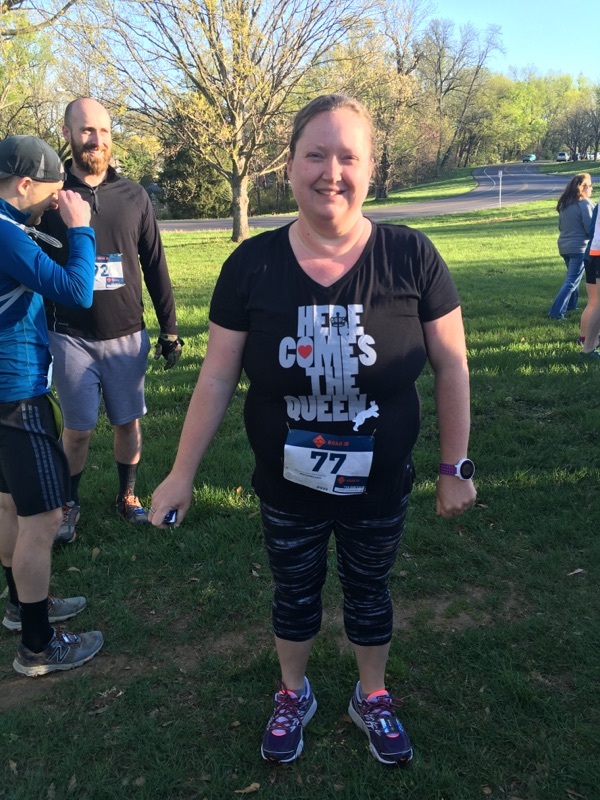 Yesterday I ran the Peace, Run and Harmony Half Marathon in New Harmony, Indiana. It was the first year for this race, which replaced the River Run because the bridge across the Ohio River it goes across is under construction for the next few years. New Harmony is a small town about 25 miles from Evansville and was founded by the Harmonists, a German utopian community in 1814. Alan and I have actually done a lot of work at the state historic site that's out there in grad school and through my old job, so I've been there a bunch of times, but never really to enjoy the sights. I should've taken some photos while out there but I didn't think about it until I got home. I honestly wasn't feeling the race at all and was thisclose to not going. I really wanted to watch the Royal Wedding and am getting over a cold. Plus Cameron was not happy that I was leaving. However, I knew that if I didn't go I would be mad at myself for not showing up. So I dragged myself away from the wedding and drove the 45 minutes out there. I knew it was going to be hot and humid but I wasn't prepared for how nasty it really was. I'm so glad I bought a handheld water bottle a few weeks ago because I would've died without it. I didn't really have a goal for the race other than to finish, but I was hoping to finish around three hours. I lined up with the three hour pacer thinking that since I have been doing intervals I should be able to keep up for some if not most of the race. Except once we started going she said that she was running the whole way and maybe walking a few of the hills. Yeah, I knew there was no way I was going to be able to keep pace so I decided to stick with her for as long as I could then keep her in my sights, which I did for about half the race. While there were definitely some hills during the first half of the race, I was doing fairly well. I needed to average a 13:44 pace to finish under three hours. I didn't really think I was going to do it but I was hopeful and so far so good. The race was an out and back through the town to the state park and I was flying downhill in the state park. Until the turnaround when I had to go back up. I had been walking uphill and running the rest and adopted a walk/run back up the hills out of the park but I was running out of water and super hot. I finally got to a water stop and one of the volunteers refilled my bottle for me. He was a lifesaver. I started running with a woman from Louisville around mile 9 and we had a really good conversation and helped each other through the race. 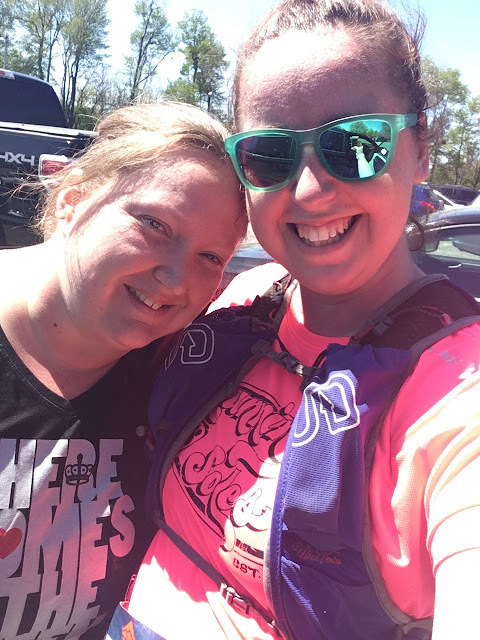 Once we got on the paved trail from the park back to the town, about mile 10, I was hoping to run the rest of the way but I could tell she was struggling so I decided to stick with her to the end. It was almost completely shaded in the state park, which helped with the heat but we were in the sun for a couple miles at the end and it was awful. They were handing out water bottles at some point and instead of drinking it I just dumped the entire thing on my head. We had been doing a walk/run for the last four or so miles and the last half mile of the race was in town so we ran the rest of the way and sprinted to the finish. The race was short the 0.1 so as I walked to the car I got my 0.1 to make it a true half marathon on my watch. I thought I had finished in 3:04 and some change but my official time is 3:08:11. The sub-three hour half marathon remains elusive but I'm glad I went and finished. I even got to watch the Royal Wedding in its entirety when I got back. How did my baby boy turn 11 months old yesterday?! His first birthday is almost here for real and I purchased some decorations for it yesterday. Blows my mind. He's not pulling up or cruising yet, although he is definitely trying to pull up to his knees on some things. He's Army crawling all over the place and we had to put the baby gates up about a week ago. He claps all the time and his latest thing is dancing when he hears music. It's so cute! His sleeping has gone to crap and he wakes up almost every two hours like clockwork. I felt in his mouth a couple days ago and his gums feel swollen on one side where he will get his first year molars so I'm wondering if that's part of it. Since he got six teeth within a month, I wouldn't be surprised if they were already starting to come in. He signs more and I swear I have heard a few Mama's in there, although Alan thinks I'm nuts. He also shakes his head no when he doesn't want something. Separation anxiety has kicked in big time and he freaks out whenever I leave. We went to the Y this morning and I'm so glad Cecily is already out of school and was with him because he was freaking out, poor kid. Overall he's a happy boy though and I'm so thankful I've been able to stay home with him this past year. I can't believe my next update will be when he's ONE! I started the day with a 6.5 mile run down to some trails (yes, I know... :-) ) and back. I haven't gotten a lot of miles in since my cray running weekend and since I have yet another half next weekend, I needed to get a longer run in. I knew Alan and the kids had something up their sleeves because Cecily has been hinting all week. That and Alan had left a photo order up on my laptop, Oops! Even though I got sidelined by some mud and it's super hot out, I had a good run. After doing Backside these trails were a piece of cake. I finally got myself a handheld water bottle with a gift card I forgot I had and tested it out. I'm so glad I had it because I definitely needed the water in the heat. Since it's supposed to be just as hot next weekend I will totally be taking it with me. I love it! It will go up in the office along with the photos. I have been wanting a medal rack for ages and Alan made this for me. He also went out and grabbed us lunch and has been doing things around the house I have been asking him to do while I hold a sleeping baby in the papasan chair and catch up on my reading. It's been a low key Mother's Day and I love it. Hope all you moms out there are also having a great day! Sunday I ran the Backside Trail Half Marathon after doing the River City 10 Miler the day before. I wasn't sure how my legs would feel going into this race but they surprisingly didn't feel that bad Sunday morning. The arch in my left foot was sore and that is also the foot that is prone to plantar fasciitis. Other than that, the only issue I had was that it had dipped into the upper 30's and I was freezing! I had capris on this time but short sleeves and no jacket. I knew I would warm up eventually but until then my hands were going numb. This was my first half since before Cameron and since I wasn't able to do the Disney half I had signed up for, I decided I was wearing the shirt I would've worn for that race. It's the Red Queen from Alice in Wonderland...I'm weird and like the villains :-) I said I didn't have any expectations for either race this weekend and I really meant it for this one. I almost never run trails because I'm a klutz and I have a healthy fear of being hacked to death in the woods by myself. When I do run them, they are pretty flat. 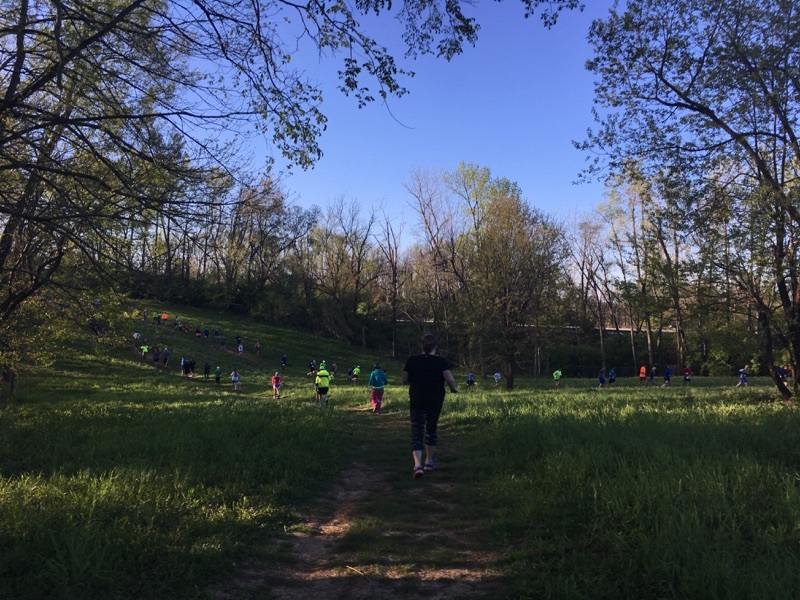 This race runs through two parks in Louisville, both of which are hilly. I've ran the Healthcare Classic and Urban Bourbon on the roads through Cherokee so I had an idea of what to expect. Or so I thought, ha! My fastest half was right at three hours so I was hoping to finish between 3.5 and 4 hours. We started out running through grass to spread out before entering the single track trails. My initial plan was to stick with my friend at first and then go from there but I had lost her within the first mile. She took this picture of all the runners and all I can think is how skinny I look from behind so I thought I would share. Before I completely lost her, I told her that I could definitely feel it in my legs that I had run the day before and I remember telling myself that it's all a mental game and I would be fine later on. Once we got into the woods everyone really spread out - there was a married couple behind me and a girl in front of me, but those were the only people I saw. I was trying to stay close to the girl in front of me to make sure I was going the right way but within mile 2, I tripped and lost my shoe and got passed by the married couple. We wound up running mostly together through miles 3-6. I didn't take many pictures of the trails but during the early miles I was thinking that there is something to be said for being out there running in nature. We were running along a creek and it was pretty nice. I had warmed up and the temperature had warmed up and it was perfect running weather. Once we got into the second park I stopped at an aid station and the married couple kept going so while I could see them, we weren't together anymore. I was keeping them in my sights so they could navigate instead of me :-) The route was marked and I good with directions, but you never know. I found out at the finish that a girl I passed had actually missed a marker and wound up running 15 miles instead because she ran a section twice. Oops! Between miles 7 and 8 I tripped and fell. Faceplanted. I was so stunned I just kind of laid there for a few minutes. I got up and kept going, but after that I was way more careful and walked a lot more. I got to another aid station and when they asked me how I was I told them I was over it. They told me that I'm now an official trail runner because I fell and that I wasn't the only one that day. I knew I would finish but I was still over it. It was somewhere in here where there were these two guys mountain biking on the trails and passing me over and over again. I know they were just out doing their thing too but they were getting on my nerves because I kept having to move out of the way. I was just like really, you have to choose this particular path out of all the trails out here?! I had completely lost the couple ahead of me when I fell so aside from the annoying bikers, I was alone and beginning to lose it at this point. My knees had begun hurting around mile 6 and after I fell it got way worse. I just kept telling myself keep moving because if you don't you're gonna get stuck. I was also seriously contemplating texting Alan to tell him to send me an Uber because I was done. I was almost at 11 miles when my friend texted me telling me she was at 10 miles and asking where I was. I told her that she was gonna catch me and that I was never doing this again. I stopped at the final aid station, chugged some Powerade and water and kept going. A large chunk of mile 12 was on the road that connects the parks and I was so excited because I thought we just ran up the road to the finish. Oh no, we had to go back on the trail we had run to get there. I just remember screaming noooooo and that I hate trails. The last mile ran along a golf course, as had mile 5. Trying to distract myself to the finish I thought how funny it would be if my father-in-law was out golfing at this course...I found out later that he was although he didn't see me. By this point I was getting passed by the lead marathoners who had run the course twice. They were all super encouraging, letting me know how close we were to the finish. I finally came out of the woods, asked the person directing traffic where to go and sprinted to the finish. I came in just under my goal of four hours, finishing in 3:58:28, even though the course was short. I knew my friend was probably right behind me so after getting my medal and post race snacks I waited for her to finish. Here I am, barely able to move. I'm glad I did it but I don't know if I will again. Never say never though, right? Trail running just isn't my thing so I will probably stick to shorter races on trails next time.